The more common recyclable materials of paper, cardboard, aluminum cans, glass and mixed plastic can be dropped of in any labeled “single stream” recycling container on campus, such as the ones in dormitories, McKee said. Other recyclable objects have specific locations to be dropped off. For plastics, most mixed plastics can be recycled through UConn’s recycler Willimantic Waste, McKee said. The exceptions come from specific products, like bubble wrap. Despite the implementation of paper straws all over campus, both paper and plastic straws cannot be recycled, McKee said. Before someone drops off their recyclable items, food should be washed out of them, if permissible, McKee said. 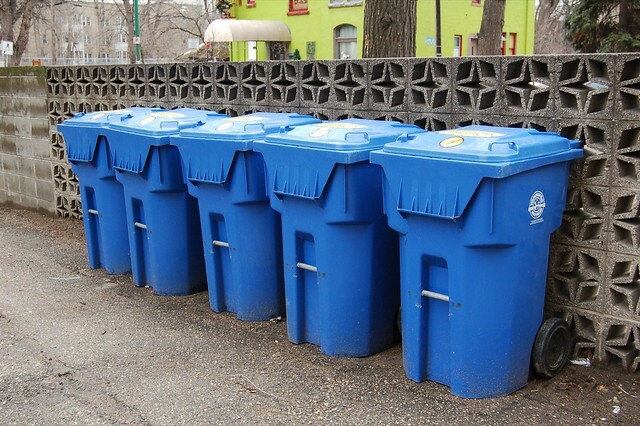 Food and liquids can ruin recyclables like paper and cardboard. The way to tell the difference between a trash and recycling container on campus is the color of the bag, according to a Willimantic Waste flyer. Trash cans will always have black bags and recycling cans will be clear. UConn uses single stream recycling on campus, meaning all recyclable items can be placed in one container, McKee said. Multiple stream recycling, better known as source separation, is when the consumer has to sort the items on their own and is not typically used. “[Source separation] puts more responsibility on consumers to sort items appropriately and is generally only required when recyclers’ infrastructure is not capable of sorting items efficiently mechanically,” McKee said. Once recycling containers are filled, custodians move the bags to recycling dumpsters and compactors, McKee said. Willimantic Waste will pick up the recycling and bring the bags to their sorting facility. At the sorting facility, workers at Willimantic Waste will separate the items by material type and get rid of anything that cannot be recycled that got in, McKee said. Once the like recyclable items are together, they are pressed into bales they are sold to re-manufacturers. Recycled items do not go to landfills, as there as “virtually no landfills in Connecticut,” McKee said. McKee said that he guessed that the most common recycled item is plastic bottles, but one never knows what they might find at the recycling company.